The Rolex lady stainless Date is a fantastic watch. 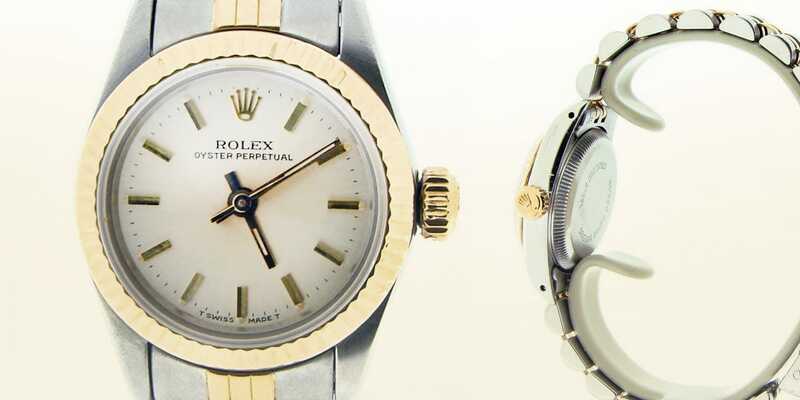 As an Oyster Perpetual, it sports the same waterproof features and profile as other Rolex models. As a non-date model, it is easy to set the time. This video will demonstrate how to set the time and wind the watch without compromising the Oyster case’s ability to stay water tight. This is a ladies stainless steel, non-date, Oyster Perpetual model. It is a 67194. The instructions I will give will also apply to the two-tone, the solid gold, and the older 6719 models. This model does not have a date function. Right now it’s in the wearing position. Notice the crown is screwed in all the way. What I am going to do is show you how to manually wind the watch to fully charge the movement. The reason why this is done is if the watch has not been worn for a few days or if you have just received the watch. This will allow the watch to run properly. First what we are going to do is in a counter-clockwise motion we’re going to unscrew the crown to its’ first position. Then, clockwise we’re going to go 20-40 full turns. This is fully charging the movement. Now we’re going to want to set the time; we’re going to pull the crown out –to its’ last position. Now it is about 7:50 right now. Okay, were going to push it back in and screw up. This is how we are going to –lock it back into its’ winding position and now you can wear and enjoy.